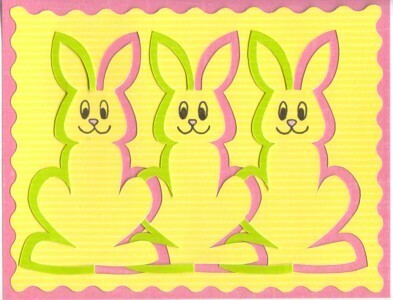 Two patterns are included in the Easter Bunnies cut and fold pattern. These patterns work best when cut from paper that is a different color on each side (duo paper). For best results read all the way through the instructions before starting. 4" x 5 1/4" duo paper. NOTE: if you are going to cut a decorative border, start with 4 1/4" by 5 1/2". 4 1/4" x 5 1/2" colored or patterned background paper. If you are going to cut a decorative border around your design, do so now, before cutting the rest of the pattern. Decide which card you will make and cut the the pattern from the pattern sheet. Cut along the rectangle surrounding the pattern. Using low-tack tape or plastic-tack center and attach the pattern face-up on the duo paper. Use the rectangle around the pattern as a placement guide. Place the duo paper with the pattern attached to it on a cutting mat. Using your craft knife, carefully cut both lines around each half-bunny (or Easter basket) making sure that you cut through both the pattern and the paper underneath. Remove the pattern. Each half bunny (or Easter basket) should now have a narrow border around it. Fold back each of the half-bunny borders and tuck the edge of each border under the bunny next to it (refer to picture). Draw the faces on the bunnies. You can use a light box to trace the faces from the pattern if you don't like to draw. Write or stamp your greeting as desired. Mount your work on the 4 1/4" x 5 1/2" colored background paper, then mount the paper to the front of the card blank. 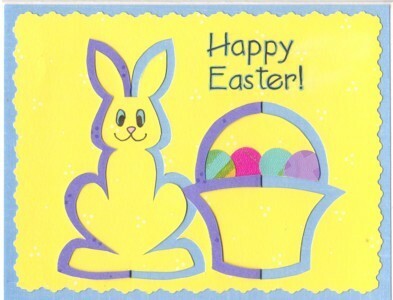 If you made the bunny with the basket, add four punched eggs to the basket, trimming the bottoms of the eggs as needed so that they look like they are in the basket.